Is the Universe fake? Prove it. It’s a theory that seemingly won’t die: The idea that the universe we know is not real, but in fact some kind of Matrix-like simulated environment in which we exist solely as programs, acting out some user’s will and awaiting the moment when someone decides to switch it all off. Some fascinating movies have been made on the subject (like The Thirteenth Floor, above, to my mind a more interesting and deeper movie than The Matrix) and Tron. It’s a lovely intellectual/philosophical exercise. But that’s all it is. And until someone provides some fresh meat to this theory, I refuse to even entertain the notion. What do I mean by “fresh meat”? Simply put, a way to demonstrate that the universe we know is a simulation and not a “real” environment. We need an unimpeachable experiment that will provide evidence, one way or the other, of the reality of reality. What we need is a physics experiment that will only work if physics is not real. Obviously, that sounds weird… but it’s exactly what has to happen. Scientists know that there are certain aspects of this world which can only work/exist if physics works the way we know it to work. Conversely, there are things that can never work in a world governed by physics, but could be made to work in a simulated environment. This understanding is necessary to prove the existence (or non-existence) of reality. Using this logic, someone has to devise a “reality experiment” with an Outcome, A, that would only work if the physics we think governs us are, in fact, simulated… faked… not real. In other words, physics would tell us that Outcome A was (literally) physically impossible, and when tested, it would prove to not work. Outcome A must be an outcome that can only happen if we are, in fact, in a simulation; there is no real-world way to spoof the outcome, nor does physics suggest that we could, even with the absolute resources required to do so. 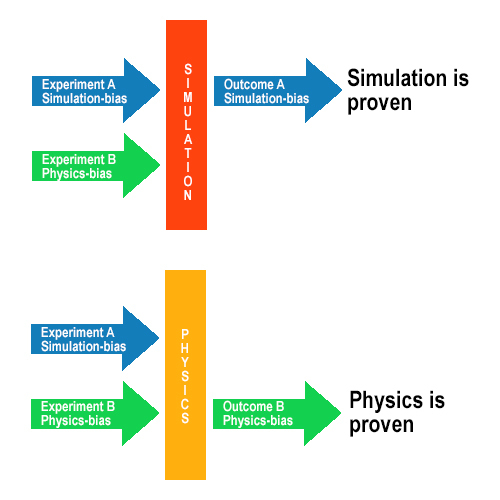 As a bonus, if a second experiment had an Outcome B that always worked in the real environment but absolutely could not be faked in a simulated environment—in other words, in no simulated environment could Outcome B ever be made to happen—you could compare outcomes for a double-proof. If Outcome A works and B does not work—the universe is simulated. If Outcome B works and A does not work—the universe is real. And if neither A nor B works—or if they both work—the universe is either more complex or much weirder than we can possibly imagine. Either way, I’m going to wait patiently for someone to devise the experiments and run them. And until they do, you can stop bothering me about this whole “universe is fake” stuff. Next Next post: Transhumanism? Or just humans? Even if we did run some kind of experiment, the results would be highly open to interpretation. The universe could be “fake” in many different ways, and the word “real” is not always the easiest word to define.